Never mind that he was one of only 5 cars to take the track, never mind that none of those other 5 cars was ever going to be faster, no Lewis was 'brilliant'. Given that the previous post to yours in this thread was 5 days ago, no one could have possibly made that claim in here or used it as a justification of the thread's thesis. I doubt it. Lewis has enjoyed a major incumbency advantage in 2007, 2008, 2010 and 2017. Of all the drivers, Kovalainen probably did the best arriving at Hamilton's team. It would take something very special for Verstappen to unseat Hamilton after switching teams. I'd wager Hamilton to take the first season but the latter seasons will probably see Max prevail. Don't bet your house on it.. You might be disappointed..
Hamilton and Verstappen seem to have a huge mutual respect for each other. I think that Hamilton would be the least complacent about beating Max if he moved to his team. Max knows who is the Boss(of speed) and Lewis sees a bit of himself when he looks at him. Max has spent a LOT of time playing simulators and videogames so I am sure he has boosted Lewis Hamilton's onboard pole laps views count on Youtube. The young guy is bright. I will make sure to bump this thread again in 2019. I think it will be you who'll be proven wrong. Just don't do like Nico. I'd like to see Verstappen beat Ricciardo first though as he's lost out to him for two seasons now, which isn't so impressive as to say he'd likely outdo Hamilton. Hamilton is the best of this generation as long as we assume that Max is already to be counted among the next generation. Otherwise it's getting too close to call. Max is the biggest talent to come into the sport since Hamilton's rookie season. 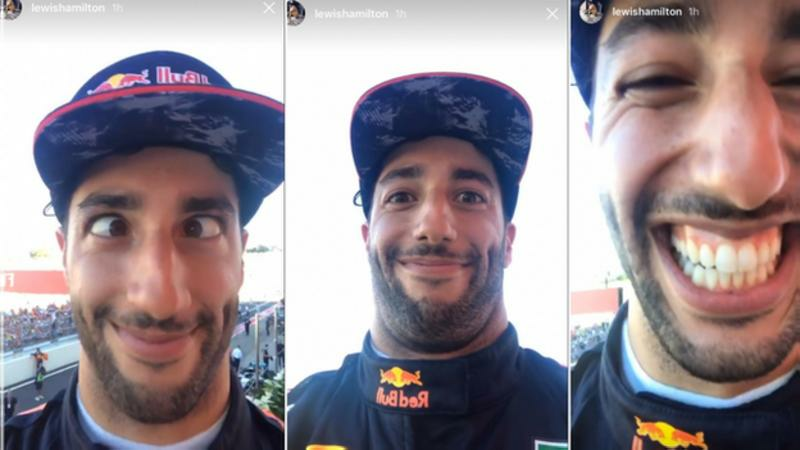 I don't think that Max has been given the same opportunity to compete in as many races as Ricciardo this season. I'm not saying that Max would necessarily have beaten Ricciardo without the reliability issues, but his season has been severely curtailed by his engine failures. I certainly agree, but he's still gotta get over the top on points as that's what it's all about in the end. I think he's demonstrated that when he's on it over a weekend he's got everything you could want from a racer. You guys are on the wrong thread aren't you? Hamilton has to be close to it know purely on results, but there is another point to be taken into account in that his titles have not just been about winning Grand Prix but also about engagement. With the crowd, with other celebrities and through the media. Have to say though that Ricciardo beats him for pure humour, can you imagine Vettel or Rosberg doing this? Yeah, I think Max is definitely the heir apparent to the crown once Vettel/Hamilton/Alonso are out. Certainly seems to have the edge on Ocon/Wehrlein/Sainz out of the 'new' generation, though LeClerc is certainly making waves in the junior formula. Ocon is making steady progress though, MV's future development depends if he has a decent PU next year or force a drive in a championship winning car, I don't think a Mercedes seat is nailed on at all. The WDC is not over until the fat lady sings. Verstappen is actually under contract to Red Bull for 2019. I'm not so sure about Ocon, I think the car has flattered him. In my view he's been too far from Perez's pace to be considered a future star and doesn't seem to have made much progress during the season. Nah he's got this one. Same way it felt last year that his name wasn't on the trophy because of all the things going against him, it now feels like his name is on the trophy for this year with things going for him. I just can't see Mercedes falling apart for 2-3 weekends and Lewis is in great form so it just looks nailed on. He's a firm favourite now but things can still go wrong. Agree. Swap him and Vandoorne and I think Stoff, with a car that behaves normally, would get up to speed quicker than he did at Macca and he'd be more of a threat to Perez than Ocon has been. He's got talent though obviously and it's his first year but he's been lucky he's had such a reliable and competitive car which has given him the chance to be in points consistently which has got some headlines but he's just not troubling Perez enough or me, especially over 1 lap which isn't really a Perez strength. Last edited by Lotus49 on Sun Oct 08, 2017 11:35 am, edited 1 time in total. she's definitely clearing her throat at the moment. It would take an almost unimaginable sequence of disasters for Lewis to lose it now. Without Ferrari suffering reliability issues on both cars in Malaysia and both suffering DNF's in Singapore added to Japan there would be nothing in the standings or even Vettel would be leading. That's nothing to do with Mercedes holding a pace advantage in the last 3 races. Yeah Singapore and Malaysia were clearly Ferrari pace wise imo. I'd give Suzuka to Mercedes though. Vettel would have still got 18 points in Japan minimum though. Hamilton literally could not have asked for anything more in Singapore and Malaysia, there's luck then there is what happened those two weekends on both strong Ferrari tracks. Yeah I think we're on the same page, I was just agreeing the Mercedes haven't had a pace advantage these last 3 weekends. More like 1. Vandoorne is the wildcard in this situation. He's flown under the radar due to his slow start, but his recent performances against Alonso have been much improved. Although obviously he's not quite in Hamilton 07 levels of rookie competitiveness yet, however Alonso has a more harmonious relationship with the team. Max is definitely the current stand out driver of the under 25s by a level, and closest to being a complete driver, however they are all still developing. I can't sit comfortable until it's won. It'd effectively have to be twice as bad as 2007. There's caution, and there's sheer unmitigated pessimism! Same could have been said of Vettel 3 races back really. We don't have to imagine it. We have seen what can happen! It's not quite that bad. in 07 Kimi was 17 points which in new money is 43 behind with 2 races to go. Vettel is 59 points behind with 4 races to go. If Hamilton gets involved in a start incident and has a failure then it all comes down to who performs best over the other two races. That would be me, finger nail biting to the end.